Egyptian presidential advisor for strategic affairs, Mostafa Hegazy, stressed on Tuesday that foreign and regional parties are not playing a mediator role in Egypt's crisis with pro-Morsi supporters. 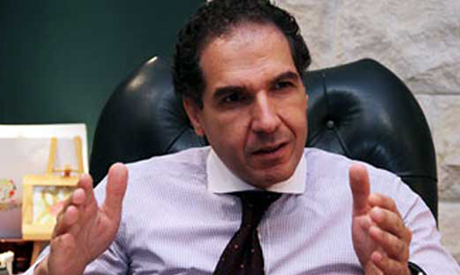 "The truth is, we have international parties, partners in the international community and they're keen on closely understanding the truth behind the current crisis," said Egyptian presidential advisor for strategic affairs Mostafa Hegazy to state news agency MENA. A number of foreign officials have visited Cairo for talks in recent weeks, as tensions continue to mount between the new military-backed government and the supporters of ousted president Mohamed Morsi who continue to demonstrate against what they describe as the “military coup” that ended his presidency on 3 July. On 30 July the EU’s foreign policy chief Catherine Ashton met Morsi, who has been detained since his ouster, and reported he was in good health, without giving details of the talks at the meeting. Muslim Brotherhood leader Mohamed El-Beltagy has since claimed Ashton pressured Morsi to accept the end of his presidency and acknowledge the new government during her visit. On Sunday night US Deputy Secretary of State William Burns, along with UAE Foreign Minister Abdullah bin Zayed and Qatari Foreign Minister Khalid Al-Attiyah, visited senior Brotherhood figure Khairat El-Shater in Tora Prison where he is being detained, to discuss a possible end to the political deadlock.